Global warming is not just a catch term, it is a very serious topic. Most of the world’s scientists as well as a growing number of people are of the opinion that we are creating a situation that is soon to spiral out of control, if we don’t do something now (and that means immediately), to stop it. We all watch and listen to the news, but we may not be paying attention to some of the most surprising results of global warming. More of our forests are burning. Global warming heats of the temperatures of the world’s forests and turns them into literal tinder boxes. Scientists also attribute the higher number and duration of the forest fires to earlier snow melt, due to global warming. We are watching the destruction of some of the world’s ancient remnants of civilization, as they crumble before our eyes. Temples and monuments are feeling the effects of increased temperatures, rising seas and pollution. They have stood for thousands of years, but are destined to be destroyed, maybe within our lifetime. The mountains are growing. Yes, the melting of the ice caps which had an incredible weight on the mountains are creating a situation where, with the weight removed, they are actually gaining height. Global warming is allowing the mountains to spring back. Satellites are speeding up. The increased amount of carbon dioxide is actually reducing the drag that the satellites typically experience. Space scientists have always had to allow for this drag percentage, and they are finding out that there is less and less drag with higher percentages of carbon dioxide in the atmosphere. The thawing of the land. 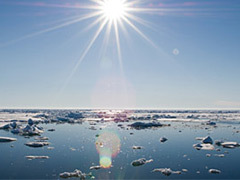 All around the world areas of previously frozen land and permafrost are thawing out. This is causing a major shift in land, including land area shrinkage and sink holes. Posted on April 23rd under Global Warming Issues. An incredible list of things that global warming is doing. I guess the conservatives won’t believe it until their own home starts to crumble. Then they will be the first in line to complain. Our pollution is destroying our past and our future. What does it take for people to wake up, stop watching reality shows and do something? Oh, that’s right, if we tax them, they will notice. Mountains growing, who woulda thought. Makes sense with all that weight on them that when you remove it, it would bounce back. Wonder how they are adjusting for the speed of the satellites? I guess they could get a projection of how much more carbon dioxide we are dumping into the atmosphere and then do the math. Pretty darned sad that we are affecting even our own technology. We used to sit on one of the far mountains in California and watch the hills burn during the fires. The smoke and ashes fly into the air and end up 60 miles away. Here other people are just driving down the freeway, and they are deluged with a rain of ash. Not surprising that it’s getting worse with global warming.